Since opening in March 1999, Severn Veterinary Centre has been accepting referrals for orthopaedic and spinal problems. To further complement this service, we opened our purpose built surgery at Berkeley House, with a rehabilitation centre that is unique and can offer your pet all sorts of physiotherapy and alternative therapy treatments, complete with a pet hydrotherapy pool and underwater treadmill. Natasha Cooper RVN runs our rehabilitation facilities, she is a registered veterinary nurse who has had an interest in this area for many years and holds a diploma in Animal Physiotherapy, and membership with the International Association of Animal Therapists. Several of our nurses are trained in canine hydrotherapy and pool water management. Our qualified staff and veterinary knowledge enables us to offer a complete rehabilitation service for your dogs and cats. Pet hydrotherapy is extremely helpful in speeding up the recovery process. Including broken bones and after major orthopaedic operations. Pet hydrotherapy has been proven to decrease the amount of time taken to return to normal mobility by as much as three-fold! 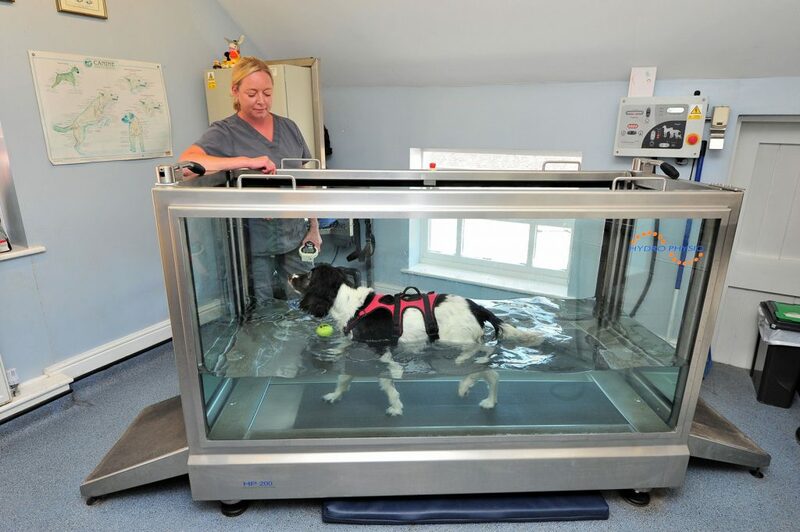 The underwater treadmill is a hi-tech piece of equipment, which allows your dog or cat to exercise whilst being supported by the buoyancy of the water. Unlike swimming, this is the only form of pet hydrotherapy that actively rehabilitates walking and trotting movements within patients. Pet hydrotherapy is not the only use for the hydrotherapy pool. Aerobic exercise is effective in the battle against pet obesity and for getting dogs and cats into peak condition prior to the working season. Treatment sessions are always done under the directions of a qualified veterinary surgeon and supervision of a qualified veterinary nurse. Sessions are available by appointment and will be complemented by physiotherapy exercises both at the centre and at home. Drying facilities are available in the hydrotherapy room and if you cannot spare the time to attend yourself you can always drop your pet off. If you would like to see a pet hydrotherapy session before booking one, we will be more than happy to arrange this for you. We also offer laser therapy. Could your pet benefit from hydrotherapy? Is your dog having trouble going up the stairs nowadays? Is your cat no longer able to jump up where he or she used to? Does your pet occasionally groan when getting up or sitting down? Does he or she take a long time to get into a comfy position to sleep? Does it seem that bending down to eat is becoming more difficult for him or her? Has your pet had an accident or an orthopaedic operation? Does your pet suffer from chronic pain, for example from arthritis? If your answer to any of these questions is yes or maybe, you should consider physiotherapy or acupuncture to help improve your pet’s condition.